Like The Hobbit meets Fraggle Rock meets The Never Ending Story, this fantasy adventure film is extremely imaginative and a lot of fun. 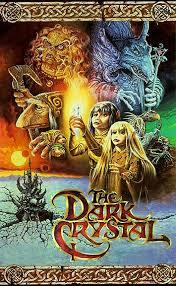 The Dark Crystal is a very dark movie and that’s surprising considering that it’s Jim Henson behind, co-directing with his buddy frank oz. these are the two guys behind the Muppets with Henson designing them all and oz giving a voice to many of the characters (Fozzie Bear, Miss Piggy). 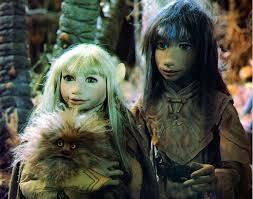 they have made many movies and creations together, including Fraggle Rock and a film that came a few years after this one, called labyrinth. but none has been as dark and violent as this movie. that’s not necessarily a bad thing. this is like a grown up movie featuring Muppets. The creatures aren’t the actual Muppets of course, but other strange puppet creations, many of which were apparently animatronics and groundbreaking for that technology. And the storyline they are given is complete fantasy of the same sort of caliber as the lord of the rings trilogy. The movie is of course not violent and medieval-like in the same way that those films were, but it is right up they’re as far as magic and creatures go. The story begins with a little history that helps us understand what’s been going on in the past and also establishes this world we are being brought into. Just like the first lord of the rings movie, the fellowship of the ring, we begin by hearing about the events that have previously transpired and caused the world to be in the state that it is currently in. as the story goes, a thousand years ago, there was a crystal that cracked, and when it cracked two different types of beings were formed. those beings are the Mystics and the skeksis. the mystics are the good guys. they are like old hunchback men who walk around with robes over their bodies and staffs in their hands. they are like elderly wizards who are move slow and are filled with wisdom. the skeksis, on the other hand are like vultures mixed with lizards. they have lots of energy and seem angry at the world. our hero is a guy named jen, who is a gelfing. this is apparently another race, only it doesn’t really count since jen is the last of his kind. or so he thinks. at the start of the movie, his dying master gives a mission jen. the mission is to recover the lost shard of the crystal. The master even tells jen where he can find it. Jen will need to go see a creature called aughra, who is a small, wise being kind of like yoda from the star wars films. aughra is in possession of the shard and will give it over to jen. and so jen sets out. there’s some more to the story, about how three suns are going to be aligning and if that happens before jen replaces the shard in the rest of the crystal then the skeksis will rules forever. it all sounds kind of silly. the main idea is that jen has to get this shard and fast. and so he sets out on his way and as he is sent off, the skeksis send out creatures to go after him. the creatures that the skeksis send out are like giant beetles. they are scary and creepy as hell with their lobster like black claws and way of slowly moving around, bobbing up and down as they slice through walls. jen finds the guy he’s looking for, aughra, (who is holding his eyeball up in the air, like the three witches in the Greek mythology story of perseus and medusas). and right after he is given the shard, the beetle creatures break in and capture aughra. jen makes a narrow escape and runs off to safety. the next part of the movie involves jen meeting another gelfing and striking up a romance with her. she also thought that she was the last of her kind, and the two of them hit it off right away. they take a boat ride together, and have one of those cute little romance moments that feel right out of the Muppets. I’m pretty sure Kermit and miss piggy took a row boat ride together once too, probably in the middle of a sweet little dream song, and it probably felt a lot like this. there are so many creatures and ideas here that by the end of the movie, it becomes hard to keep track of everything. that’s kind of funny to be saying about a children’s movie, only this really isn’t a children’s movie at all. I mean, a character is holding an eyeball out of his head for crying out loud. there is an interesting climax where jen is trying to get the shard back into the crystal right as the three suns are closing in and it’s interesting to see what happens, but at the same time, by this point it’s hard to still be focused. some movie run out of ideas as they go on and don’t save anything for the end. this movie is not one of those. in fact, the dark crystal is the kind of movie that keeps the ideas flowing the whole time and ends up giving us so much, even at the end, that it is us who run out of energy and not the movie. we run out of mental energy. the movie is a lot of fun and super creative, but it does get harder to enjoy the longer it goes on. I’d like to think this is a great movie for kids, to encourage their imaginations and get them thinking about fantasy adventures. the problem is that it’s just too dark for that. still, it is a very cool movie loaded up with creativity and fantastical creatures.